At least 72 people have died in several days of floods and mudslides triggered by heavy rains in Peru, officials say. The floods - the worst in almost 30 years - have affected over half the country. More than 800 towns and cities have declared a state of emergency. 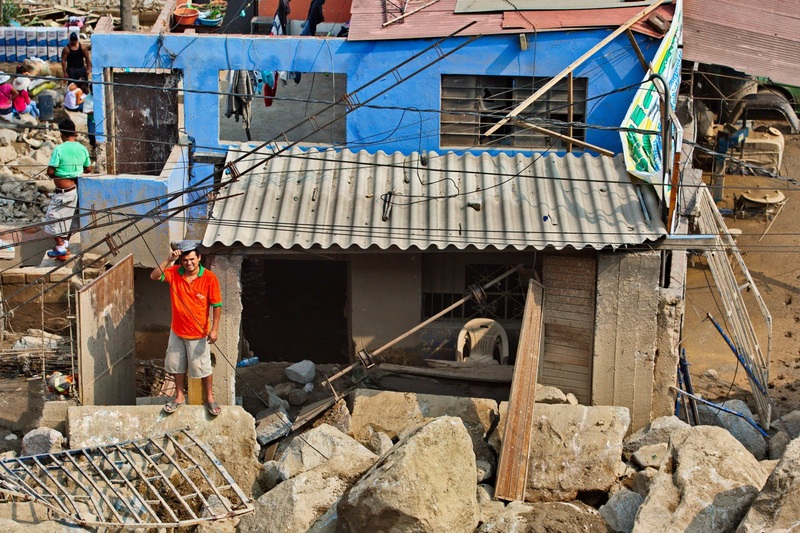 The capital, Lima, has been without water since Monday and services are only now being restored. The armed forces have been deployed to help police control law and order across Peru. There are shortages of food and water in many areas and prices have risen by 5% on average in the past week, reported the BBC. The intense rains, overflowing rivers, mudslides and flooding being experienced in the country are the worst seen in in three decades, Peruvian authorities said Saturday, affecting more than half the nation as the death toll since the beginning of the year hits 72. Prime Minister Fernando Zavala on Saturday updated the number of dead to 72 in comments to local radio station RPP. The government says 374 people were killed in 1998 during a similar period of massive rains and flooding caused by rains blamed on the El Nino climate pattern. The rains have overwhelmed the drainage system in the cities along Peru's Pacific coast and the health ministry has started fumigating around the pools of water that have formed in the streets to kill mosquitoes that carry diseases like dengue. Lima has been without water service since the beginning of the week. The government has deployed the armed forces to help police control public order in the 811 cities that have declared an emergency. "The prices for lemons have gone up, as well as for potatoes and cooking oil," said Sara Arevalo, a mother of five who was shopping at a market in northern Lima. The government has acknowledged that prices have shot up some 5 percent because of the flooding. The highly unusual rains follow a series of storms that have struck especially hard along Peru's northern coast, with voracious waters inundating hospitals and cemeteries, and leaving some small villages entirely isolated. The storms are being caused by a warming of the surface waters in the Pacific Ocean and are expected to continue for another two weeks. 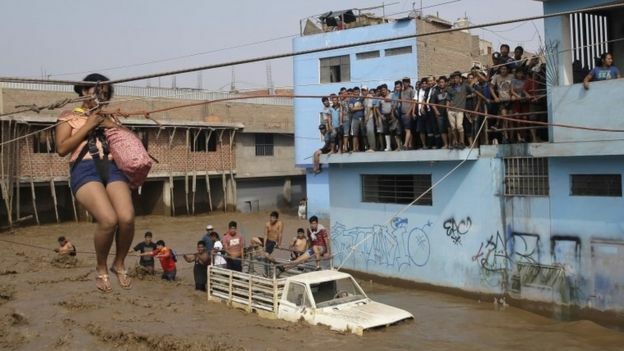 Even Peru's capital city of Lima, where a desert climate seldom leads to rain, police on Friday had to help hundreds of residents in an outskirt neighborhood cross a flooded road by sending them one-by-one along a rope through choppy waters. The muddy current channeled down the street after a major river overflowed. Some residents left their homes with just a single plastic bag carrying their belongings.